Anyway, the thought of having to pack a kitchen twice in a year inspired us to edit our gear to the bare essentials. And we managed to keep six boxes packed up in the garage – stored away and ready to go to our next stop in a year. That was, until I got the itch to make muffins… In my ruthlessness the baking accessories didn’t make the cut. But now they were essential. It was raining. We were cozy. And we just needed muffins. So back to the garage we went (I say we but let’s be honest, it was all Ross – he saved the day again!). While he hunted pans I took to the pantry to see what I could possibly turn into a muffin worth eating. Our pantry staples are in need of replenishment but with a little creativity I was a able to scrounge up a pretty ingenious combo if I do say so myself. Crammed into these muffins are the three top plant-based sources of Omega-3 essential fatty acids – flaxseeds, chia seeds and walnuts. What are Omega-3s you ask? They help regulate inflammation in the body and they’re called “essential” because we must get them from our diet – our bodies cannot make them on their own. The challenge with Omega-3s is that they’re sort of scarce in our food supply – you have to know where to look to find them and then make sure you’re eating those foods, like the ingredients mentioned here, plus salmon, sardines and dark leafy greens regularly. To make matters even more complicated, Omega-3 has an essential fatty acid cousin, Omega-6. The two work together like two sides of a coin. While Omega-3 works to decrease inflammation, Omega 6 promotes it. In the body they perform a sort of balancing act to protect our cells; we need both in the right ratio. But the problem is most of us are getting loads more Omega-6 in our diet than Omega-3 (some 14-25x more) so we’re skewed toward the inflammatory side, which over the long term is not good. Omega-6s are abundant in things like nuts, seeds, grains, cooking oils and out of the box snacks. You can keep your Omega-6 intake in check by cutting back on the processed foods and opting for olive oil over oils like soy, corn and vegetable. Grass fed meats are also less inflammatory because the animals are getting more Omega-3s from the grass rather than more Omega-6s from grains and seeds. 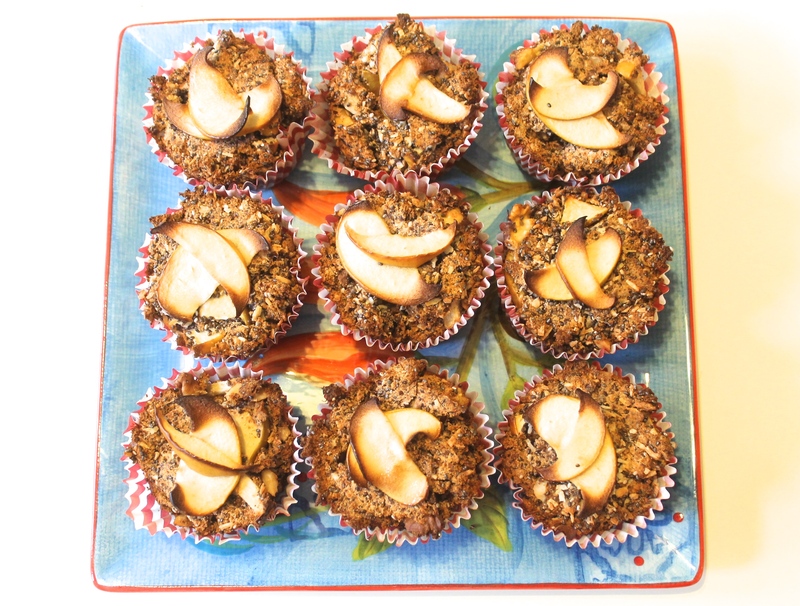 And of course you can get your fill the vegetarian way with the flax, chia and walnuts in these muffins. Wild salmon is a sure bet source as well. You know what else causes inflammation? Sugar. So it would be silly to cancel out all the great inflammation fighting benefits we’ve got going on here by adding something that’s going to take away from that, am I right? Not to worry, the only thing sweetening the sauce here is fruit – no refined sugar, or unrefined for that matter either. Just apples. And you know what they say about apples…. Preheat the oven to 315 degrees. In a large bowl, combine coconut flour, flaxseed meal, baking soda and salt and whisk until evenly distributed. Add applesauce, melted coconut oil and water and stir to mix. Stir in walnuts, coconut, chia seeds and apple. If batter seems dry or too flaky, add a bit more water and stir/mash until batter holds together. Spoon batter into lined muffin pan and bake at 315 for 40-45 minutes. Cool before serving. Yum! Will try as soon as I get some coconut flour. YUM! I will be making these soon. Thanks Mego!!! These look so hearty and delicious! Yummy! yummmmmmy…. nice “new” plates and such too 🙂 new kitchen!